The welfare of your children should always be your priority whether you and your partner are still together or otherwise. Should the case be the latter, make sure that the both of you will always come to terms as to what would be best for your children. This is when basic agreements for parenting come into play. They help to make everything between you and your co-parent become more bearable and more organized when it comes to taking care of your children. In need of parenting agreements? Say no more as we have free sample agreements just for you! 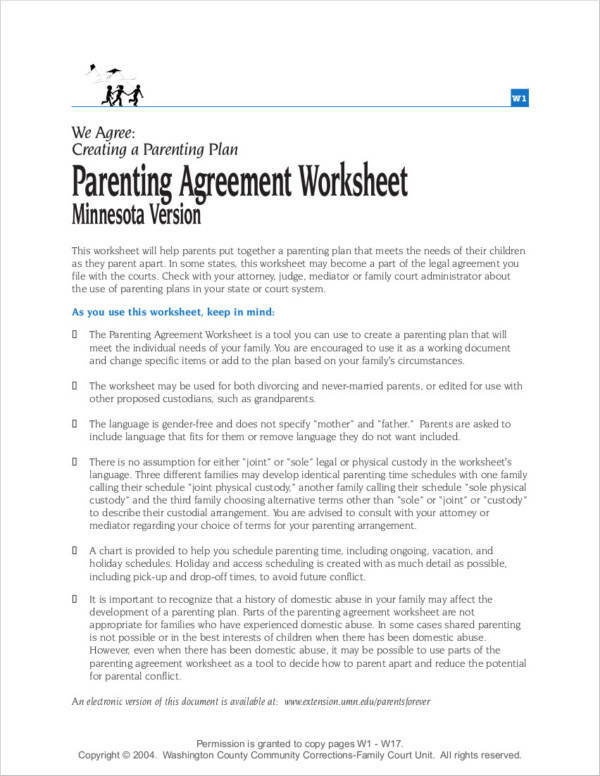 We also have tips on how you can come up with a good parenting plan that you can apply to your parenting agreement. When it comes to providing the best for your children despite the fact that you and your ex-partner are not living together, you need to come up with an effective parenting plan that the two of you need to agree on to make things as normal as possible for the children or the child. There are a couple of things that you would need to consider when you want to come up with a good and effective parenting plan. You have to make sure that you put into mind the welfare of your children and make sure that the terms and conditions that you would include in your agreement plan will always benefit your children. Here’s how you can do it. You have to make sure that you get these things sorted out first. Here’s how you can make a good parenting plan. Come up with a regular schedule. You need to first decide where your child or children will be living and how often can the other parent visit the child/children. Also, establish how much time can the other parent have with the child/children. If applicable, also establish how often the child/children can stay with the other parent. Make sure that you are also able to keep in mind the age/s of your child/children. You may also see sample separation agreements. Plan for holidays and vacation. You may opt to adjust the visitation schedules during holidays and when vacations come up. Splitting the holidays will be a good idea. For example, the mother can have the kids for Christmas while the father can have the kids for New Year. You may also consider planning out birthday parties. You may also see sample payment agreements. Consider emergencies and special cases. Make sure that you also consider what would happen in case of an emergency or a special circumstance. While emergencies and special cases are not anticipated to happen, you need to know how you can handle such circumstances. Outline who can visit the child or who the child is allowed to see. Make sure that you also monitor who the child sees, visits, or stays with. Putting restrictions on a parenting plan will be a great idea. Ensure that you and your partner will talk things out. This will include babysitter guidelines and a babysitter checklist with a schedule that will ensure your child will be in good hands whenever a babysitter is assigned to take care of your child. Exchanging procedures. It is highly likely that you and your co-parent will want to spend some time with your child/children. You can include guidelines about dropping off the child/children at the resident of the co-partner or meeting in a location that is convenient for the both of you. You may also want to include school drop off and pickup arrangements should it be deemed as a necessity. You may also like agreement examples. Choosing the activities. Make sure that you and your co-parent are cooperative enough to make sure that the kids will be able to do enrichment activities or extracurricular activities that will help them develop certain skills. It is important that you get to talk to your co-parent about what activities your children will also be allowed to participate in. 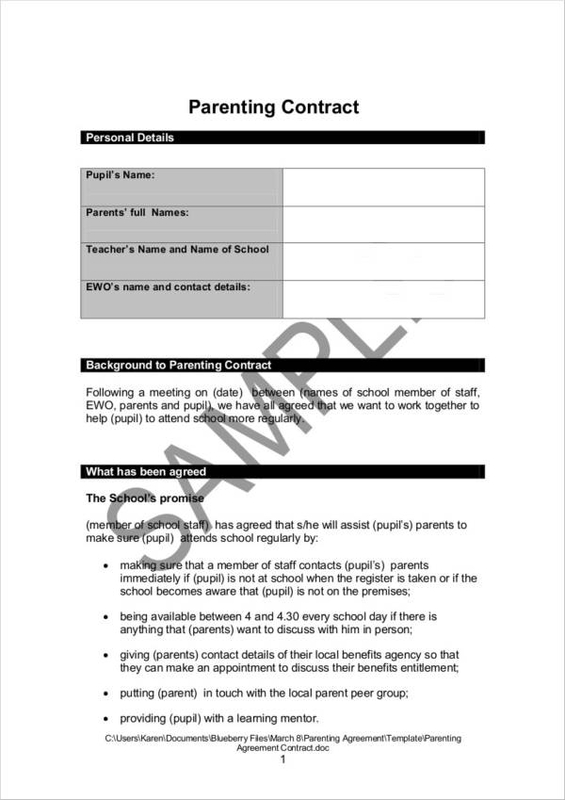 Discuss permissions as well such as if there is a need for the other parent to ask the other parent to sign waivers for activities or otherwise. Attending events. An event planner would also be a good idea to have around in terms of discussing the plans that you have. You will be able to determine which parent will attend which activity or which activities will need the presence of both parents. You may either alternate attendance of events or come to an agreement about which specific ones to attend. Communicating with the co-parent. Even if you and the other parent are now separated or divorced, communication is important in making sure that your children grow up properly. The participation of both parents is of high importance, which is why communicating should be discussed. Talk about how you will communicate with each other and also discuss what information needs to be shared with each other. 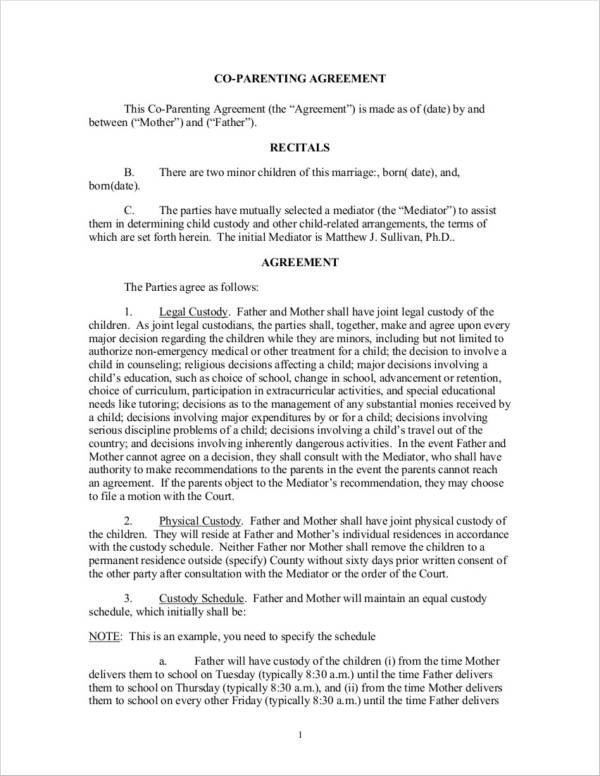 You may also see separation agreement forms. Routine coordination. Routines need to be followed in order to make sure that everything will seem as normal as possible. Attaching a toddler schedule will help to ensure that wherever the kids will be staying, everything regarding routine will still flow the same way. Being consistent will help to ensure a little bit of normalcy for the child/children. Communicating with the child. Discuss realistic rules or terms that you and the co-parent need to agree on with regards to communicating with the child/children. You may opt for fixed schedules and you may also want to come up with remedies in case of emergencies and whatnot. You may also see business investment agreements. Discuss child support agreement. Child support is important when it comes to situations like this. A fixed amount of money is usually paid by the co-parent who does not have custody of the child/children. Agreeing to a fair child support agreement is highly recommended. 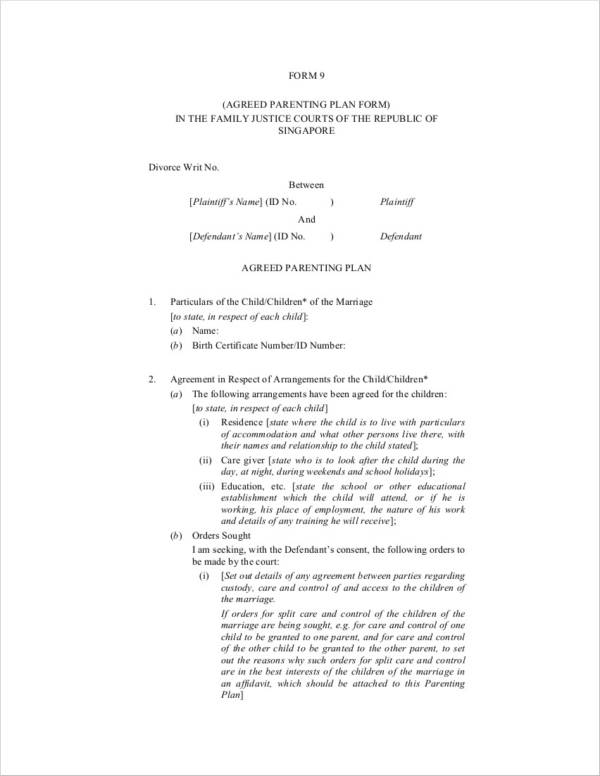 You may check out sample Child Support Agreement Templates to Download for more information. Financial support for adult children. Most of the time, financial support is only reserved to children who are still minors. However, you or your co-parent may want to include your adult children as well. Establish the age when the children will no longer be considered for financial support. Daily expenses. Thoroughly discuss how both parents are responsible for the daily expenses of the child/children. Make sure you come up with a guideline on how you can wisely spend for your daily needs. Checking out our Sample Budget Plan may help you figure out just how you can effectively come up with a budget for wise spending. Handling large expenses. You and your co-parent may want to come to an agreement wherein you will set aside a certain amount of money from your salary to a joint bank account for emergency purposes. Sharing of property. Discuss whether having items ready at each other’s residences will be more convenient for you and your child/children or would bringing back and forth belongings be more convenient. Discuss this thoroughly not just with your co-parent, but with your child as well. This would include shoes, toys, clothes, etc. You may also like executive agreement templates. Lifestyle choices. Include a provision regarding the lifestyle choice that you would make for your child/children. Come to an agreement with your co-parent. Make sure that the two of you are satisfied with what you have come to terms with. You may also see vehicle purchase agreement templates. Basic household rules. You and the co-parent should be both consistent with how you would discipline and give responsibilities to your child/children. Make sure that you discuss this in detail and discuss what should be done as well should the child/children not do as what is expected of them. Religion and cultural heritage. Should you and the co-parent have different beliefs and religions, decide whether you want you child/children to know of only one or of both. You may also see agreement letter samples. Schooling plans. Agree whether you would like your child/children to be in a private school, public school, or would homeschooling be more preferred. Medical needs. Vaccinations, booster shots, and taking care of illnesses should be included in the medical needs section of your agreement. Include doctors, clinics, and hospitals preferred as well as who will attend appointments for your child/children. You may also see letter of agreement templates. Going to court. 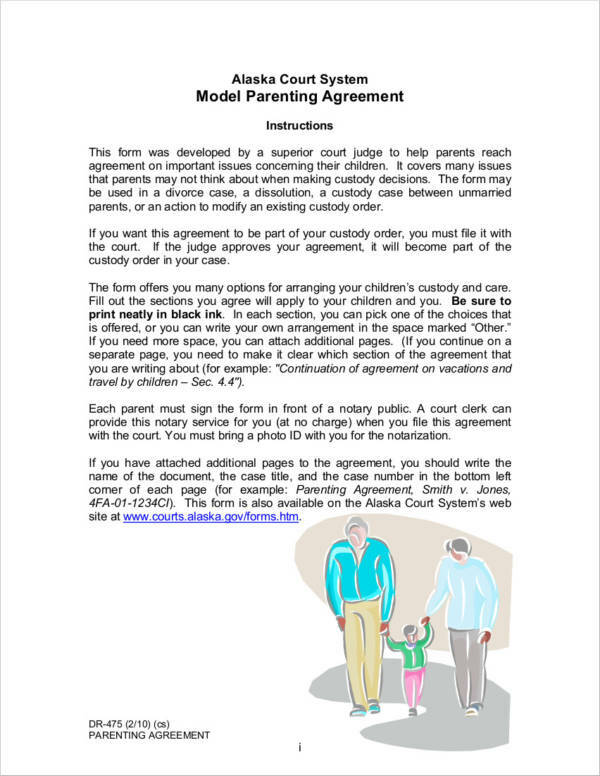 Some co-parents can come up with a parenting agreement without the need to go to court. However, this is not applicable to all co-parents as a lot of co-parents tend to not agree on a lot of things regarding co-parenting. Should these issues arise, a judge can make a fair judgment and make the parenting agreement more workable for the couple. You may also like sample agreements in pdf. Write it down. No details should be missed, so everything must be put into writing. If you can, you may opt to record your discussion session and have it transcribed. Sign the agreement. 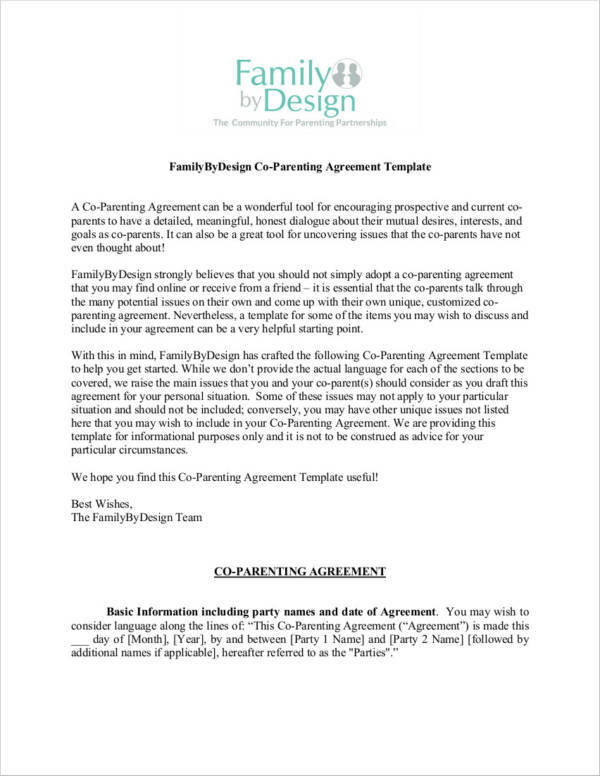 Signing is a demonstration that you and the co-parent have agreed to the terms that is reflected in the final agreement. 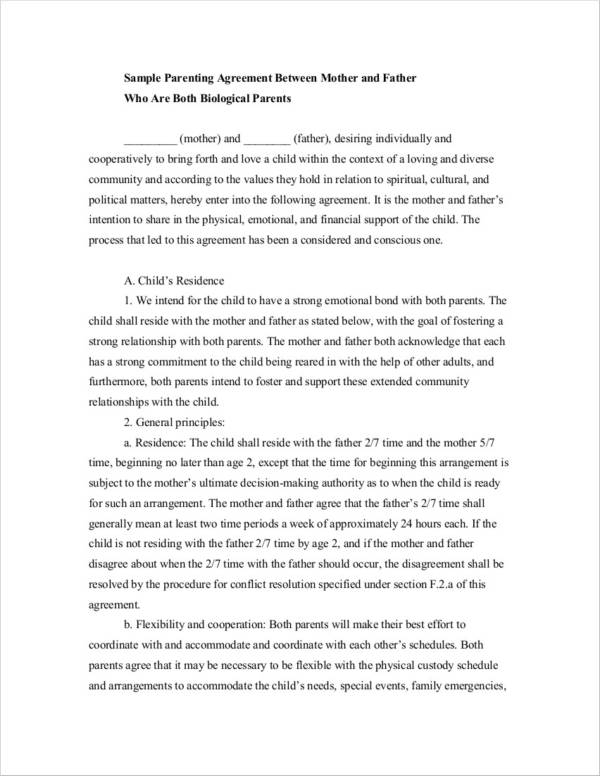 You may also see agreement forms in a doc. Amendments. Your children will age; you will find that there are changes that you would need to do as they grow older. Keep in mind that what you have planned now will not be applicable for the rest of your children’s lives. You may find more tips on Parenting Plan Templates. Now you know how to come up with a good parenting plan! 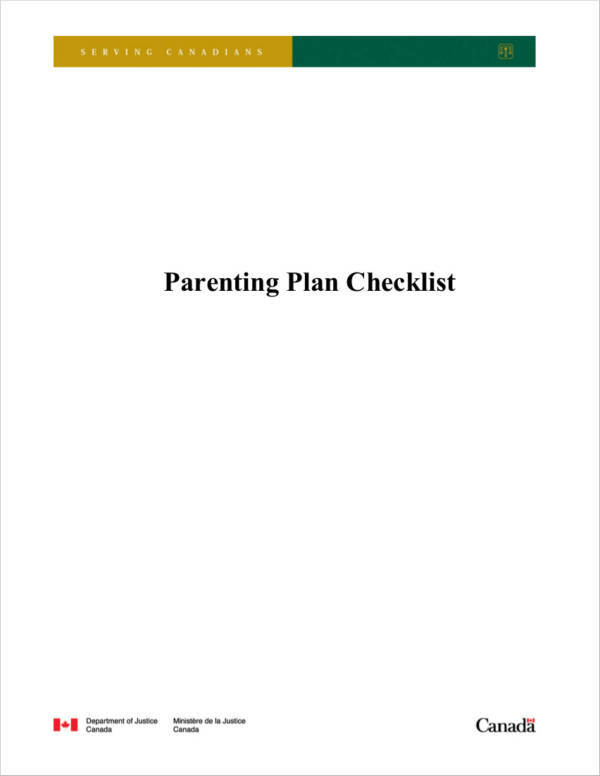 Make sure that you check out parenting plan examples as these will give you more insight on how you can properly take care of your kid/s despite being separated from your partner. You may also see HR agreement samples.